To analyze the biological network by finding the sub-modules in the network and reducing the complexity of a network for better understanding. The most complex phenomenon in the universe is Life. This complex phenomenon studied by different systematic approaches. Every living organism is composed of cells. 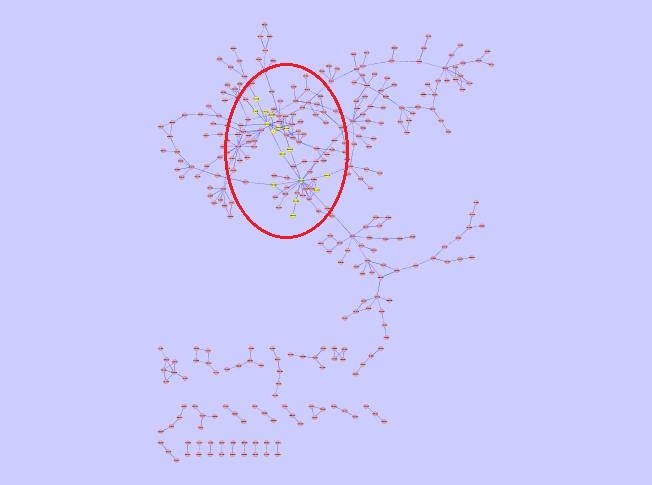 Biologists have thoroughly investigated how the parts of the cell work, they have studied the small and large molecules, structure of proteins and the structure of nucleic acids also they had came up with the interactions of a elements in different types of networks. Further, they advanced to understand the biological systems as a system. 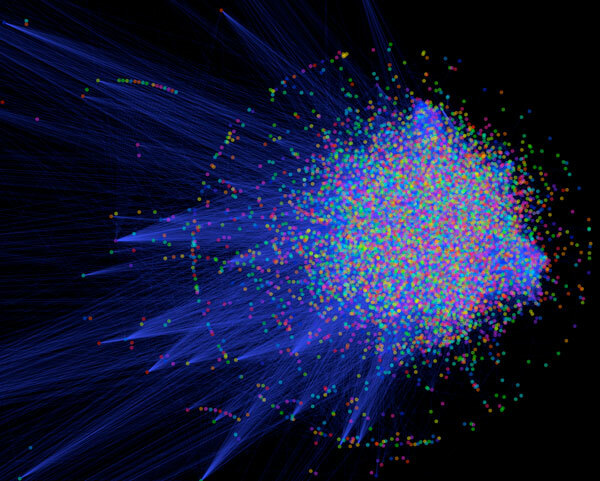 Systems biology tries to integrate the biological knowledge and to understand how the molecules play together within the network of interaction. Systems biology focuses on system that is composed of molecular components. In systems biology the network-oriented approach is very basic to understand a system. These networks computationally or mathematically represented as graphs. It has nodes and these nodes are connected or interlinked through edges. Network is simply a collection of links connecting nodes in the network. Minimum information required to form a network is connectivity rules i.e.,which node connects to which node. some examples of a network are social network, biological network, computer networks, etc. Speaking in biological terms, the links might refer to function of a particular protein or gene (nodes) or their expression patterns. Networks are collections of interactions, which contain pathways that are interlinked. All the pathways are subsets of networks, which means in a network pathways are interlinked. In biology the complexity of network is more, the interactions in the network from one to other is more difficult to find just by visualization. To reduce the complexity of these networks, the basic tools came up with different approach of finding the sub modules in the network based on the interested regions. For instance take galactose utilization pathway and the expression data of the genes involved in the pathway, use this expression data to find modules that are more significant. A network module or a sub module is a group or a cluster of nodes in a network that work together to perform some common function. If one can identify the nodes in a module, we can reduce the network complexity, by replacing the individual nodes into a single Meta node. So, there is no worry about internal workings of the module. In this experiment, the sub modules or sub networks found by integrating the expression data, with the network data. The expression data obtained by different molecular biology techniques. 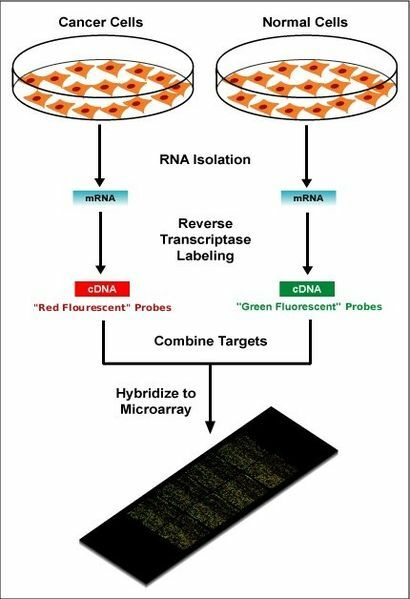 One of the most highly advanced and significant technique to study whole sum of genes simultaneously is microarray technique. Microarray is a glass slide to which DNA molecules are arranged orderly at specific spots. These spots may be million in number of identical copies of DNA molecules. To determine the on and off genes, researcher should need mRNA molecules present in cell , then the researcher labeling the mRNA molecule by reverse transcriptase generates complementary cDNA to the mRNA. The fluorescent nucleotides are added to the cDNA, with different dyes for different conditions. The labeled cDNA samples are placed on microarray slide, which bind to the complementary DNAs. Following hybridization, the spots in the microarray excited by a laser and scanned at suitable wavelengths to detect the red and green dyes. If a condition (healthy) for a particular gene was in greater level than from other condition (diseased), one would find the spot to be red or it would be green. Thus at the end of the experiment one can see the image of microarray. After getting the image of microarray, the image processing and analysis would be done and the expression data is represented in different ways. These expression values are integrated with network model and based on these expression values the network model is analysed using different softwares or tools. To model, analyze or to visualize the networks using different approaches, specific computational tools or software’s are necessary. Computational biologists came up with the many tools like cytoscape, cell designer, Ecell, J-Designer, etc. Cytoscape is an open source platform to visualise and analyze complex networks, which is protected under GNU LGPL (Lesser General Public License). It is available to all platforms. It is also extensible through plug-in architecture for different computational analyses. 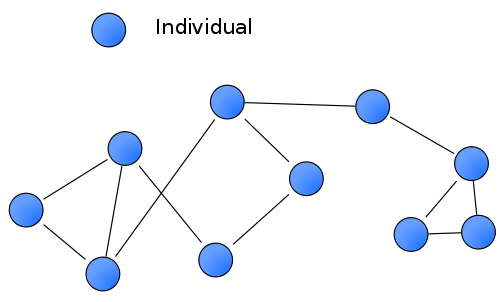 These biological networks are organised as graphs, connecting each node to another node through edges (called as interactions). This software becomes more powerful when it is used in connection with large databases of genetic interactions, protein-protein interactions.